There has been growing tension between Cambodia and Thailand over the past few weeks over the disputed territory near Preah Vihear Temple. We visited both countries in September, and there’s no love lost between them, that much was clear. 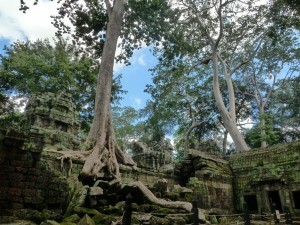 Here’s a piece I did on Siem Reap and the temples of Angkor Wat. IT APPEARS out of the darkness; a gradual lightening of the sky bringing its famous shape into focus – the outline of the five towers, like closed lotus buds, becoming tangible in the waking light. Watching the sun rise behind Angkor Wat, with the reflecting pool mirroring its beauty at your feet, is to witness this iconic structure at its most resplendent. The world’s largest religious monument, it is so integral to Cambodia’s identity – it adorns both the Cambodian flag and the 500 riels note – that it is tempting to see dawn at Angkor Wat as a metaphor for a country that is itself coming out of darkness, gradually reshaping its identity in a new dawn. Although Angkor Wat is a relic of a time when the Khmer empire spread from Vietnam to Siam, it is now the hopeful symbol of a country desperately struggling to overcome a barbarous and tragic recent history. That relationship isn’t just symbolic, either – nearly two million visitors come to this corner of Cambodia every year to see King Suryavarman II’s 12th century temple and the sprawling complex of temples that spread out north of the charming town of Siem Reap. It is an invaluable source of income for a country that was economically devastated by the rule of the fanatical Khmer Rouge in the 1970s and the brutal, decades-long civil war that followed. Were it not for this built legacy of the Angkor era, the country would seem to have little to attract international attention and tourists. But many visitors will find themselves falling for everything else about the place too. The dozens of other temples in the World Heritage Site, for instance, would be the pride of most other countries, rather than also-rans. The town of Siem Reap, meanwhile, has managed to retain its colonial charm while growing into a lively destination for travellers in its own right. Just south of the town are the floating villages on the Tonle Sap, the massive freshwater lake that feeds and irrigates Cambodia, almost defy belief. This is a bustling water-borne community where children learn to swim before they learn to walk. North of the temples is the Landmine Museum, founded and run by a former Khmer child soldier who has dedicated his life to removing the unexploded ordinance that maims hundreds of Cambodians every year, a tragic legacy of the civil war. The museum is vivid testimony to the fact that, above all, it is the Khmer people who ensure this is a country worth getting to know – welcoming, courteous, playful, always smiling, determined to overcome their tragic past. The usual itinerary around the temples is a well-worn one, largely unchanged from the days when the two main routes – the grand circuit and the petit circuit – used to be visited on the back of an elephant. Nowadays, the elephant has been replaced by the tuk tuk, and it’s the perfect way to get around, with none of the insulating effect of the car. There is no shortage of tuk tuk drivers, and reliable ones can be booked through hotels for about (€9). There are so many temples to visit in the park that a three-day pass for 29.34€ (€29) is recommended, though a seven-day pass would allow you to examine every ruin in great detail. It is worth getting a guide, at least for the first day – the temples are so numerous and the history so complex that the €18-€22 is well spent. Many visitors make it to Angkor Wat for sunrise, then head for the extravagant Bayon temple at the heart of the ancient city of Angkor Thom where every tower is adorned with the faces of four Buddhas, contemplative and commanding. Then the traditional route takes in some of the smaller temples, jewels all of them, before returning to Angkor Wat in the afternoon. To avoid the crowds, it is worth reversing that – around noon, you can have Angkor Wat virtually to yourself, which is perfect for examining the carved bas reliefs detailing Hindu epics that line the walls on the lower level, and exploring the upper level, the Bakan, with only a few young Buddhist monks for company. Our guide, a Tiger Woods doppelganger called Von Syden, explained the meanings and uses of the temples, as well as the history of the Khmer kings who built them; interspersing them with his own stories and anecdotes. Though hardly uncommon, it is a life that illustrates the full tragedy of Cambodia’s recent past – a family that suffered at the hands of the Khmer Rouge, a near brush with conscription as a child soldier in the civil war, years as a young monk in a Siem Reap pagoda, and the struggle to build a future in a devastated country. As he related these stories, the last millennium of Khmer history became compressed and intertwined, the lives depicted on the renowned bas reliefs not so far removed from the lives pursued in the countryside of modern Cambodia; the Khmer Rouge’s brutality not so different from the vision of hell carved on the walls. Angkor Wat and many of the other temples were a refuge for Khmer Rouge fighters, and Vietnamese bullet holes still mark the outer walls. It was in the northern reaches of this province that Pol Pot died in 1998, finally freeing the country from his malign influence. 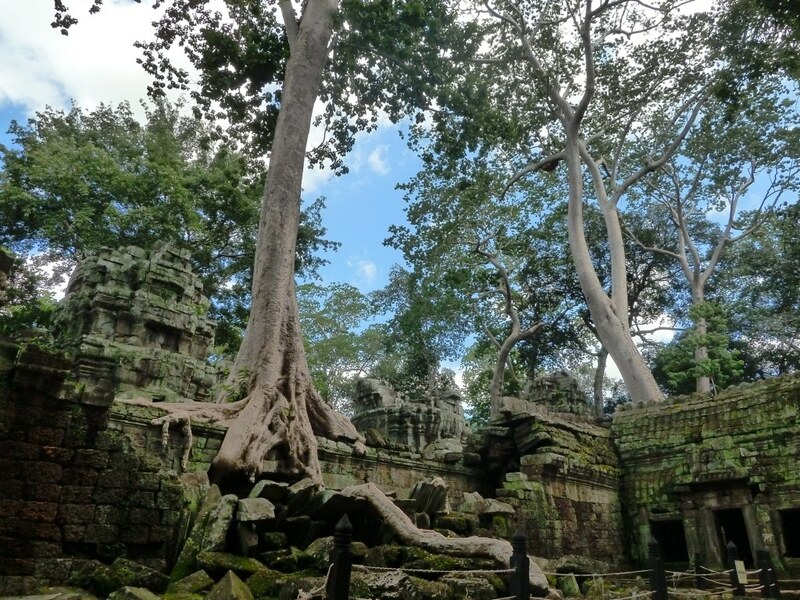 Two of the most beguiling other temples are Ta Prohm and Ta Som, where the trees wrestle with the stonework; their roots strangling walls and doorways. The result is a sense of foreboding and chilling evidence of the inexorable decline of all societies. These eerie temples not only offer a glimpse of a vanished past but a foreshadow of our future. Where once these temples played host to thousands of monks, now they are returning gradually to nature. As the day draws to a close, most of the crowds go to the Phnom Bakheng temple, high on a hill-top, for spectacular sunset views, but to avoid the scrum you are better off going to Pre Rup, a pyramid temple that rises above the tree tops. At most temples, groups of children try to sell bangles, fridge magnets and postcards. Unesco recommends ignoring them, so as not to encourage truancy, but many of them are delightful, well-mannered and frankly adorable – prepare to have your heart melted, especially by the little ones who count to 10 in Irish, or who challenge you to games of tic-tac-toe in the sand. Bring crayons or sweets to dole out instead of dollars but, above all, give them a smile and respect. Siem Reap is a delightful town, delicately balanced between the old provincial colonial town it used to be and the sprawling tourism hub it threatens to become. At the moment, the place is modest and charming. The centre around Psar Chas, or Old Market, is a bustling grid of streets, with a great range of cafes, restaurants, markets, galleries, boutiques and bars. Once you become accustomed to the constant offers from the tuk tuk drivers you can get a feel for the distinctive allure of the place. The French colonial influence dominates, with balconies overlooking the lively streets, and arcades and galleries housing stylish restaurants and bars. The tourist centre is Street 8, rather unpromisingly known as Pub Street, but there are plenty of high-quality venues catering to all types of visitor, especially on the narrow lanes adjacent to Pub Street. They are so full of trendy bars and chic boutiques you could be in Brooklyn (best of the boutiques is KeoK’jey, which features classy clothes made by HIV-positive women in Phnom Penh – such high-end charitable enterprise is increasingly common in Siem Reap). The Old Market is a hub of activity, with a central gallery packed full of food vendors selling fish, meat and fowl, and locals bargaining with seller after seller. Other markets are directed more towards visitors, the pick of them being the Angkor Night Market, which features locally made crafts along with mass-produced souvenirs. Between the dizzying range of silk scarves, jewellery and teas and coffees, we gave the Dr Fish foot massage pool a go – for €2, we had dead skin eaten off our feet by a shoal of hungry Garra Rufa, a hysterically ticklish experience that will soften even the most hike-hardened sole. A walk along the river, with its manicured, tree-lined pathway, offers a glimpse of locals at rest and play. We were entranced by a group of men playing shuttlecock, an Asian game of exquisite skill which is a balletic variation of badminton using feet instead of rackets. The four players gracefully sent the shuttlecock arcing through the air, effortlessly returning it from behind their heads, anticipating its flight perfectly. As we had come to expect, they were only too happy to stop and explain the game. The friendliness and sincerity of the Khmer people, we realised again, is the real strength of Cambodia. For all the poverty and corruption, for all the buried bitterness about the civil war, they never seem to forget the simple pleasure of a smile and joke. Come to see Angkor Wat, sure, but it’s the warm hospitality of the people that you will take away in your memories. Travel Guide: We were lucky enough to have a terrific guide by the name of Von Syden show us around the temples, you can check him out at his website here.